DofE Expedition services for schools and youth groups. Although we are based in the North of England we work with schools and youth groups all over the UK. We train groups in schools all over the country and run their expeditions from Dartmoor to Hertfordshire to the Highlands of Scotland taking in Wales, The Yorkshire Dales and the Lake District in between. We can even run expeditions international expeditions in Europe. Wherever you are based in the UK we can probably help. The Expedition section of the Duke of Edinburgh's Award comprises of four elements. In a nutshell, if required, we can deliver the complete programme for the expedition section of the Duke of Edinburgh's Award at Bronze, Silver and Gold level from training through to qualifying expedition and presentation. However, many organisations do some of the work and only ask us to take on what they would find difficult to deliver. Providing a team of supervisors to supervise expeditions where you have trained the groups and planned the expedition. Provide a few supervisors to work alongside your staff and under the direction of a suitably qualified member of your staff. In the first 3 examples above Lupine Adventure are taking responsiblity for the safety of the participants so we are working to our procedures whereas in the fourth example we are operating under your direction and so the responsibility rests with your organisation. When working to Lupine Adventure procedures we staff expeditions with one member of staff per group (as a minimum). If you have some staff who hold nationally recognised outdoor qualifications (e.g. BEL, ML, WGL, HML) or who have completed the training in these awards then we may be able to induct your staff in our procedures and reduce the number of staff that we need to hire and therefore the cost. If you are interested in simply hiring supervisors to work on expeditions that you have planned then visit our Hiring a supervisor for your Duke of Edinburgh's Award group page. If you would like more information on our complete packages then please read on. We can run a full training course or simply cover the bits that you require help with. The country code and highway code. Deciding what to take and how to carry it all. During practice expeditions we will accompany the group for as long as we feel is necessary before letting them off on their own. This is usually a stepped process, moving from accompanying to shadowing to more remote methods of supervision. On qualifying expeditions we usually meet up with the groups the afternoon before the expedition for a kit check and quick refresher on emergecy procedures and navigation strategies. On the first day of the expedition they are immediately under remote supervision conditions. When remotely supervising a group our staff will work out a daily supervision plan. They will look at the route and identify when they will need to be very close to the team and when they can hang back. Generally speaking we stay close when the team are in a) remote areas, b) areas of potential physical danger and c) areas of complex navigation. We will not necessarily walk with the group (especially on the assessed expedition), they may not even see us, but rest assured they will be being supervised. We will meet up and chat to each group at least once per day during their walk and will check them into their campsite each evening to perform an assessment of their well-being. Participants are given a emergency phone number for their supervisior, while we cannot guarantee that it will be in signal all day our staff will always be contactable during the night in case of emergencies. The prices for our complete programmes can be found on our Costs and funding page. "I just wanted to provide feedback for Owen & Hayley. They were both very professional and although obviously in charge of our health and safety were willing to fit into the way our practise expeditions are usually run, making great suggestions and showing a willingness to be flexible where needed. It was a pleasure to work with them both and I am now totally inspired to undertake my ML training and assessment." "Thank you so much for everything you have all done for us over the last few days with our expeditions. It has been fantastic working with you and the service provided was excellent. The cadets have thoroughly enjoyed their expeditions, I'm sure they'll be sleeping well today! ... It was lovely to meet Andy and Jo and the expeditions went very smoothly. We would highly recommend Lupine Adventure! " "I am amazed at the way that the instructors are able to tailor their work to the needs of a group or person. I have seen Dave work both with adults and young people and his technical skills and group management skills are just superb. He adjusts his approach to the group/ person with ease and is such a consummate professional, but yet a lot of fun to work with." "We were very pleased with the whole Lupine 'experience'. the service we received was great and Dave was a great asset to the team from Day 1. We would have no hesitation in recommending him to others, and working with him again if the need arises." "They are amazing. Our school has used them for the Gold expedition for the past three years. 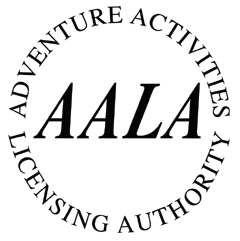 With their non-profit making ethos I feel they are true to the old idea of DofE being staffed by volunteers, but with a completely professional level of qualifications and expertise. The resources which they make freely available for sharing are fantastic. At a time when I worry that DofE is getting too corporate and concerned with branding/selling merchandise Lupine are a breath of fresh air." "The staff from Lupine have always wanted to pass on their knowledge to our participants, this is particularly important during the practice expeditions, where they put in the extra effort to teach properly and not just get the groups through the weekend." 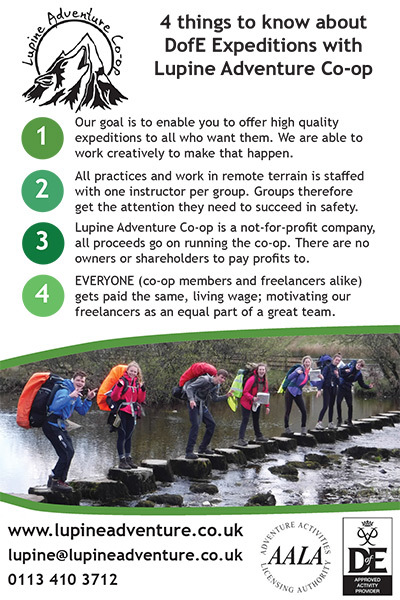 "As a busy school trying to deliver the expedition for the DoE Award to an ever increasing number of young people, we have found Lupine Adventures absolutely invaluable. Not only have they provided excellent instruction to the participants, the staff are easy to get on with and a pleasure to work alongside." "Cat, Pete and Will were absolutely brilliant - calm, knowledgeable and professional. I hope that they didn't get too much cheek from our boys, and had an enjoyable few days too."